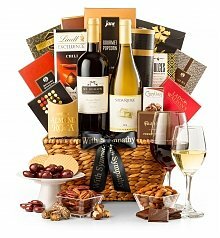 Leave a lasting impression of your gratitude with our thank you wine gift baskets. At my busy real estate office, the chances of ending up with difficult clients was probable. But when I met Mr. and Mrs. Anderson, I knew that not only would I be able to sell their home without a hitch, but I’d also enjoy working with them, too. I was right! Right from the beginning and through the whole process, my clients the Andersons were positive, friendly, outgoing and most importantly, they took my advice when it came to selling their home. We ended up selling their brownstone in Baltimore much more than their asking price. When it was all settled, I knew I didn’t have to, but I wanted to send them a thank you gift just for making the whole process so easy for all of us. We had celebrated with a glass of wine a few nights back, so I knew they were wine-drinkers. 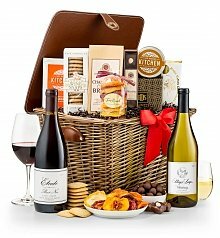 I thought a bottle of thank you wine would be nice, but then I came across GiftTree.com and saw their collection of thank you wine gift baskets - beautiful baskets overflowing with luxury food and most importantly, fine wine. It was perfect! When it comes to sending a gesture of gratitude, it’s easy to let the sentiment go understated. 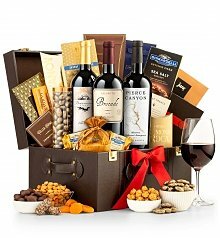 That’s why GiftTree offers a line of bountiful, beautiful Thank You wine baskets. 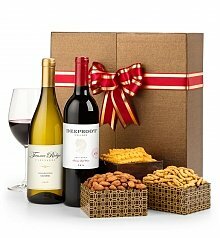 First, our expert sommeliers handpick the wines that go into our gifts. It may be something like Belle Taine - a California red blend with tiers of red currant, fig and almond that give way to dark chocolate and cherry notes. Or maybe it’s Solus Estates - a chardonnay with layers of delicate pear and grapefruit. 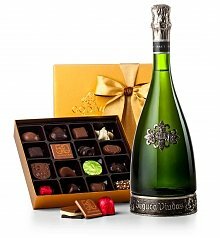 Next, our cellar masters pair these noteworthy wines with delectable gourmet fare like chocolates and truffles from Lindt and Godiva. 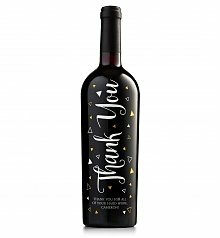 GiftTree’s designers then arrange this thank you gift inside exclusive keepsake containers made from enduring materials, creating a thank you wine gift that guarantees your sincere appreciation will never go understated.